Like most of us, I knew about the dramatic end of the HMS Hood. What I didn’t know much about was the ship’s pre-WWII career. Commissioned in May 1920, the Hood became the flagship of the Battlecruiser Squadron of the Atlantic Fleet. In the early 1920s she sailed virtually all over the world in various capacities, “showing the flag” as it were. She received a substantial refit from May 1929 to March 1931 and again in 1932. In January 1935 near Gibraltar she was accidentally rammed by HMS Renown, damaging her propeller and putting an 18” deep dent in her hull. After repairs she was present in the Mediterranean for parts of the Spanish Civil War before entering port again for an overhaul that ran from January 1939 to August 1939. She was to receive a very substantial modernizing in 1941, but the outbreak of WWII prevented that from happening. As a result when she entered the war many of her systems and machinery were in fairly poor shape. Her first action in the war was to lead sweeps into the North Sea and northern Atlantic in search of German raiders, but she never saw any action. After a brief time escorting troop convoys she ported in Plymouth for a refit that lasted from December 1939 until late May 1940, after which she was the flagship of Force H in Gibraltar. When the Vichy French fleet refused to surrender in June 1940, Hood took part in the attack near Oran, finally firing her guns in anger and inflicting damage on the French fleet. Despite its popularity the Hood has only been issued as an injection molded kit in 1/350 scale by Trumpeter. The good news is that it is an excellent kit, highly detailed and very accurate. Being so popular, it is also well supported by a slew of photo etch sets, resin upgrade sets, turned metal gun barrels and wooden deck overlays, allowing the modeler to indulge his Hood fancy to the fullest. Trumpeter’s Hood comes to you in a big sturdy box, compartmentalized on the inside to protect the various parts. 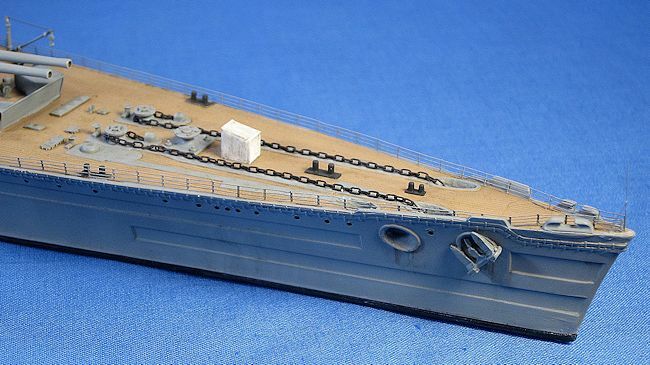 The hull is molded in two pieces split at the water line, allowing the modeler to choose between building a full hull model or a seagoing model. If one builds the waterline version there is a one-piece flat part to fit to the bottom of the hull. If one chooses to build the full hull version the kit provides a rugged looking display base and nameplate. There are two bags containing two deck sections each, and eight sprues chock full of nicely detailed parts. Trumpeter includes a very small of fret of photo etch parts, and a small sheet of decals for the ship’s flags. The instruction booklet is large and nicely illustrated, and a large full color fold-out gives you the painting instructions using Gunze paints. As other modelers on this site have pointed out the #1 reference for anything Hood related is the excellent website www.hmshood.com. 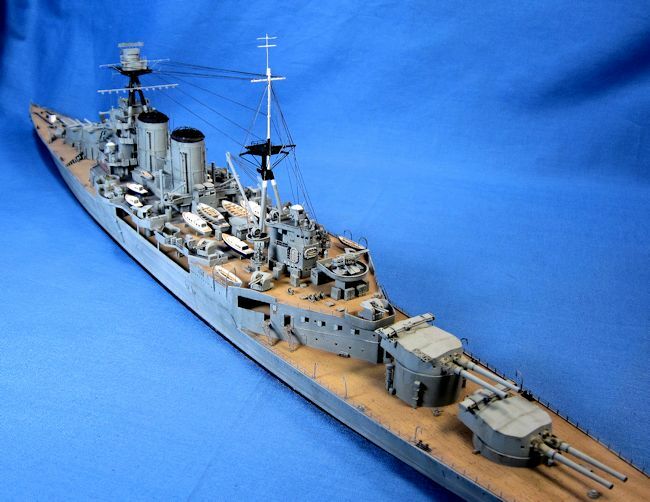 This site, maintained by the HMS Hood Association, is not only a wealth of knowledge and history about the real Hood, but also features excellent articles for building model Hoods. I leaned on two articles in particular, “Trumpeter’s 1/350 Scale Hood – Basic Review Plus Improvement Suggestions” by F.W.Allen, and “Paint Schemes of H.M.S. Hood, 1920-1941.” The first article points out sensible corrections that can be made to the model while not overwhelming a Hood novice like myself, while the second gives you excellent painting information for the entire life of the Hood. Another reference, or more accurately, work of art, are the online photos of a completed 1/350 Trumpeter Hood by Mr. Nick Dogger. In short, Mr. Dogger’s Hood is a masterpiece. Mr. Dogger detailed the model so thoroughly it makes your head swim. He set his model in a realistic ocean base complete with crew members maintaining and working on the Hood. Small boats come and go as men walk about and paint crews on tiny scaffolds paint the ship’s hull. His rigging is incredible, and his detail is a thing of beauty. 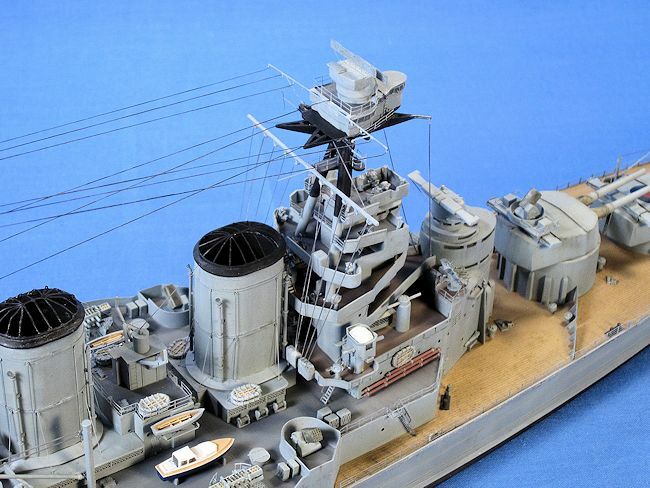 Even if you’re not overly interested in the Hood or ship models in general, do yourself a favor and go online and look for the photos of Mr. Dogger’s Hood – you will be amazed and inspired. Back to the build. A couple of years ago I built Trumpeter’s Graf Spee and had good luck complementing it with Eduard’s photo etch set, so for this build I bought Eduard’s #53020 photo etch set and also Aber’s #L-30 metal gun barrel set. The FW Allen article points out that the only real sin committed by Trumpeter was how it molded the main gun turrets – in short, they’re not very accurate. I replaced them with a resin gun turret set from White Ensign Models. From time to time I find myself really looking forward to building a big ship model. All those decks and ladders and guns! After reading many positive reviews of the model online, I dove in. With any big ship kit, you have to have a strategy as to how you’re going to build and paint the thing. For this build I decided to first attach the main deck sections to the hull and then paint and weather them, followed by building and painting the superstructure module by module. Starting with the hull, I first performed a little surgery - removing the molded on degaussing cables on either side of the hull. The degaussing cables don’t have to be removed, but the Eduard set provides more accurate photo etch replacements, so after a long night of trimming and scraping I was able to glue the long thin photo etch cables into place. I positioned each piece on the hull and then brushed on very thin CA glue using a “Microbrush”, a very small plastic brush that comes in packs of 10. The microbrush was perfect for attaching the photo etch to the plastic without overloading the area with CA glue. Up next I glued the three main deck sections to the hull. 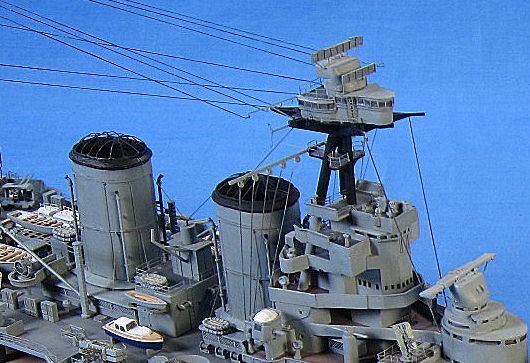 There are no seams to worry about - the joint between the forward deck and the center deck is hidden by the breakwaters (forgive my lack of correct naval terminology) on either side of the “B” turret, and the rear deck is stepped down to a lower level. I used my Dremel to carve out the three holes on the forward deck and the corresponding holes in the hull for the anchor chains. I then packed some Crayola Air Drying clay into the bow and hollowed it out with a tooth pick to create the “tunnels” the anchor chains traveled through. Much to my chagrin the clay shrank as it dried, leaving large cracks that had to be filled with Squadron Green Putty. I next attached the PE railings to the hull and then headed to the spray booth for my first painting session. I first applied a light coat of Tamiya’s Spray Primer to the hull and decks, and then pre-shaded the deck with Tamiya XF-64 Red Brown. That was followed by some Tamiya XF-78 Wooden Deck Tan, sprayed lightly and randomly to let the pre-shading show through. To paint the hull I first pre-shaded it with Testors Gunship Gray, and then sprayed Testors Medium Gray FS 35237 over that. I had to hold the hull upside down and airbrush carefully so that none of the gray would get on the just-painted wooden decking. I next lightened the Medium Gray with some Testors Flat White and airbrushed some random splotches on to the hull to replicate some fading and streaking. With the hull and wooden decks now painted, I began building up the superstructure assemblies. Following the instructions I first began attaching the “walls” of the various lower compartments to the main deck, painting them Medium Gray as I went. Once they were set and a few small gaps were filled I glued the “up deck” (Trumpeter’s words, not mine) into place. It too needed some sanding to get it to fit properly. I also masked off the surrounding areas and painted its wood areas and also its steel decking Testors Gunship Gray. 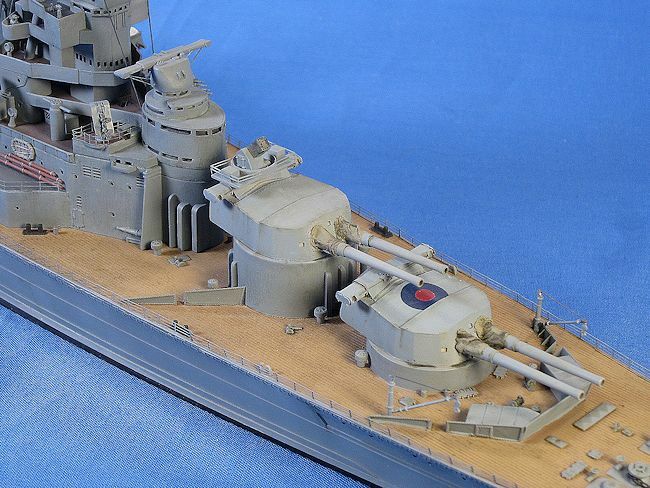 The vertical surfaces and deck details were painted Testors Medium Gray by hand. From this point the sequence basically remained the same; assemble a superstructure module, add any photo etch I saw fit to add, fill any gaps, paint it by hand, and then glue it to the ship. There were frustrations. Dealing with lots of tiny photo etch parts did get old, as did trying to handle a model that was increasingly full of said parts without knocking any off. I didn’t use all of the Eduard photo etch parts by any stretch of the imagination, just the ones I thought I could handle and would make an impact on the finished product. When I had the bridge structure complete except for the spotting platform (the uppermost platform on top of the tripod), I started on the smokestacks. My references show the smokestacks had several support wires all around them, so I added those drilling tiny holes top and bottom and running clear fishing line through them. The photo etch grills on top were fiddly, especially when I mashed the hell out of one with my finger, but isn’t that what photo etch is supposed to do – drive you to the edge of insanity? 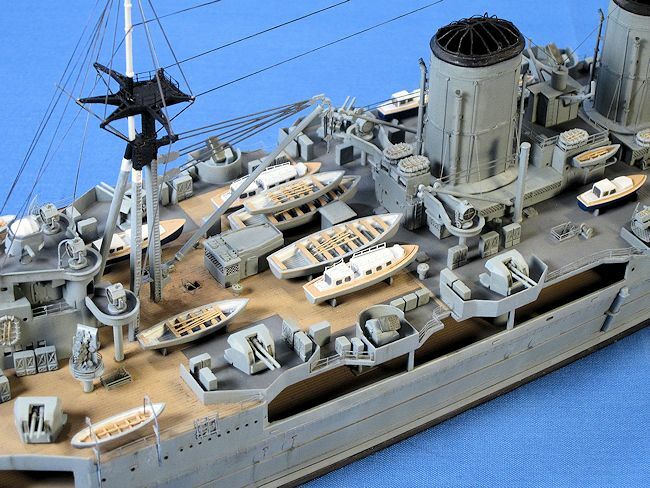 At this point the model’s structures were largely complete, but I hadn’t added any guns, cranes, lifeboats or rigging. I decided to weather the model before adding those easily knocked off items. My first weathering step was to apply a thin wash to the wooden decks using Mig Productions’ “Brown Wash”. 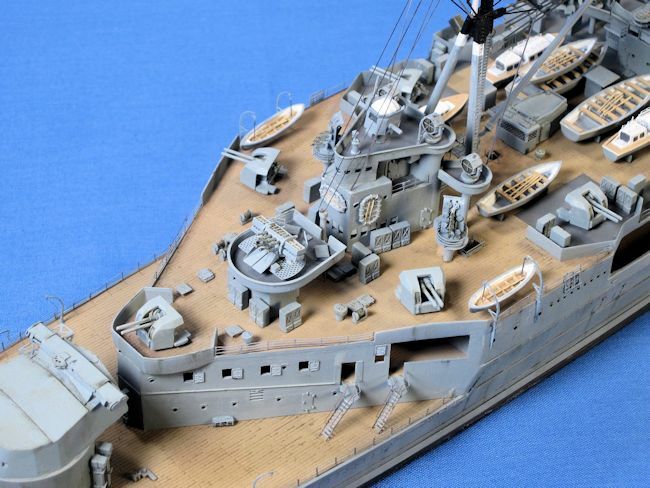 To weather the gray surfaces I did not apply a pin wash like one might do on an armor model – instead I applied some subtle streaking using AK Interactive’s “Grey Wash for Kriegsmarine Ships” on the various vertical surfaces. When that was dry I sprayed a very thin mix of 50/50 Tamiya Black/Red Brown onto the various seams and crevices of the model to provide some post-shading and streaking effects. I tried to keep it subtle because at this scale, it’s an effect that is easily overdone. Back at the workbench, it was time to rig the model – a task I dread! I used small dabs of CA glue to attach EZ Line and stretched sprue to the various masts, using pictures of Mr. Dogger’s model as a reference. With that (thankfully) finished it was time to add the final guns, cranes, and lifeboats. I worked from the center of the ship out, working slowly and deliberately so as to not knock off any of the detail. 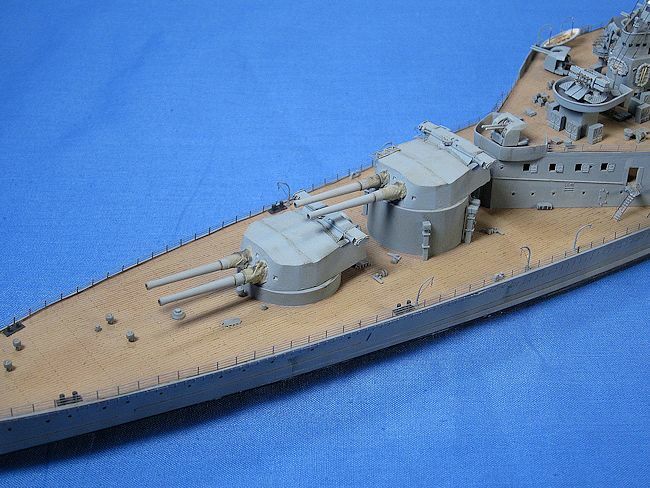 The last step was to assemble the White Ensign resin main gun turrets. This set gives you the choice of either early or late model rangefinders, in both open or closed configurations. I chose the late, open types. Once I assembled the gun turrets I added the Aber gun barrels, and then fashioned blast bags out of tissue paper soaked in water and white glue. I then primed them, painted them, and weathered them. The final step was to brush-paint over any areas that were glossy due to the CA glue. I did this using Vallejo’s Matt finish, and the model was finally done. This one took me a while. Big ship models aren’t fast builds, and adding a lot of photo etch slow them down even further. But none of that is any fault of Trumpeter’s, and I highly recommend this kit. This is the third Trumpeter kit I’ve built (the other two being their 1/48 Wellington bomber and 1/350 Graf Spee), and I found it to once again be a fun and enjoyable project. The fit of the parts was very good, as was the level of detail. Building a big ship model requires a bit different mindset than an aircraft or an AFV, but the results are worth it. Trumpeter’s Hood is a fine tribute to a tragic ship.